A hot topic to a number of prospects this past week has been new construction, expansion and new investment in properties on the new US Highway 30 Bypass through Tama-Toledo. Some prospects are recognizing the future potential of this strip as US Highway 30 is expected to continue increasing its absorption of Interstate 80 traffic. It is already the shortest route connecting Iowa’s biggest cities like Des Moines and Cedar Rapids, and it is also increasingly becoming the safest route. Others’ objectives surrounding interest in these bypass properties include accessing the coveted New Market Tax Credits. Projects under $3 million are discouraged from pursuing these credits, but the resources do extend beyond traditional industry development to include construction of hospitals, charter schools, human services and other non-profits with capacity to create high volumes of jobs. Tama County has one zone that qualifies at this time. As pictured above, it starts at the Meskwaki Settlement and runs along US Highway 30, through Toledo, and ends at the eastern edge of the incorporated city of Tama. About 15 property owners have formally approved putting their Hwy 30 Bypass and New Market Tax Credit Zone real estate on the market. Another half-dozen gave verbal indication that if it would greatly benefit the area they would be willing to consider selling. 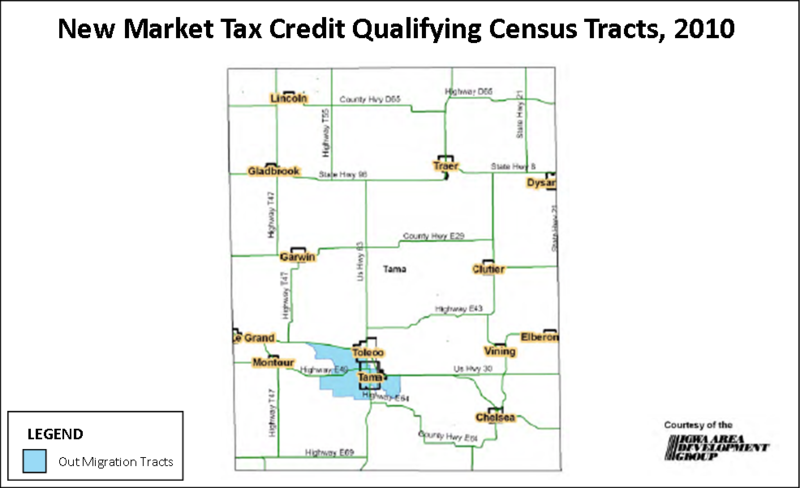 If you are a property owner willing to be on either of these lists to help prospects locate or expand in Tama County Iowa, please touch base. A list of properties formally on the market in Tama County can be viewed online by clicking on available buildings, sites, or housing.